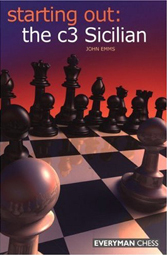 This book is aimed at players that wish to learn the basics of the c3 Sicilian, which Emms describes as an active opening with a solid positional foundation. He devotes two chapters to 2…d5, two to 2…Nf6, and one to second move alternatives for Black. He admits to displaying a slight bias for White, but writes that he points out the best choices for both sides. He explains why he believes certain lines are ineffective and indicates where he disagrees with previous assessments.